So, I purchased the DIY kit for the MR-5 and just got around to setting it up yesterday. The video instructions are much more helpful than the written instructions, but both are rather easy to follow. I also use the Avast Marine Works Auto Top Off unit which uses pressure instead of a float valve. Quality: The quality of the parts that come from Avast Marine Works is AMAZING! All of their parts are high quality and precision cut/cnc to fit perfectly. Not to mention...100% USA made! Function: The function of the MR5 is simple and very effective, not to mention...at the $54.99 price point of the DIY kit, you can't find anything THIS GOOD for this low of a price. All other reactors I have found are twice this price and more! After I had it setup, it worked flawlessly without leaks or any issues. The MR5 is filled with 1/2 cup of phosBgone and 1 cup of carbon. 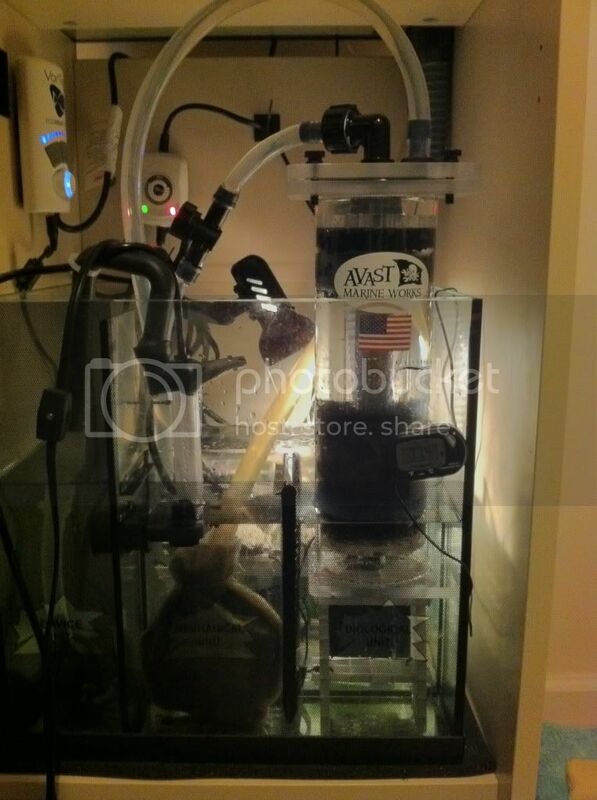 The MR5 and the refugium are my only means of filtration. I have used skimmers in the past, but realized that I can get better filtration without the heartache by using equipment like the MR5 and a refugium. Better results too! The auto top off has never let me down and was well worth the extra money compared to the cheaper float valves you can find online. I love the water pressure tube it uses rather than a cheap float valve like 99% of the other companies. :-) Very satisfied with both items. Customer Service: This is a BIG ONE for me...as I won't use a company any longer if the customer service is below acceptable standards. I had a small issue with assembly and contacted Justin and he responded right away with solutions and also gave me his cell phone in case I needed to get a hold of him after hours. Every email was responded to promptly with detail. Onto the pictures. 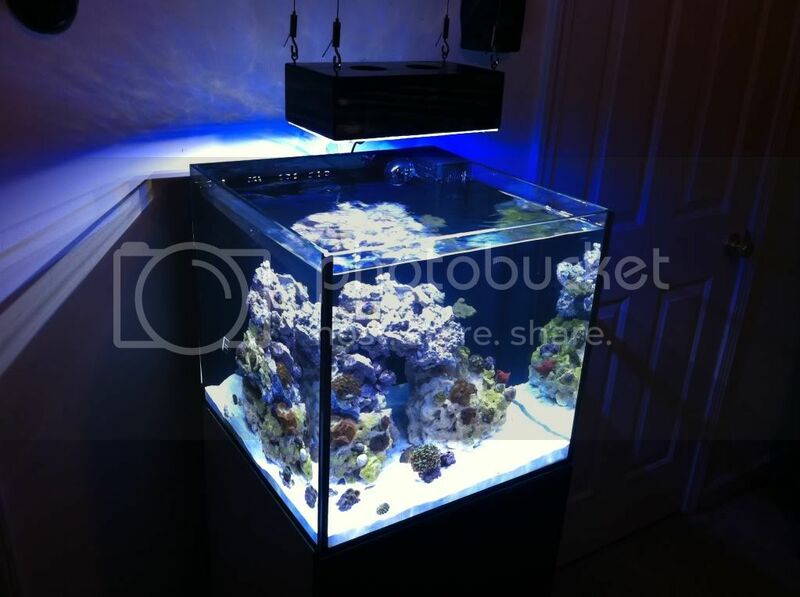 My current setup is an Elos Mini 20 gallon with the stock Elos stand and sump. I didn't want this unit to be placed outside of my sump area, so I used a table saw and changed the base plate dimensions from 5x5 to 4x4.5 and built a eggcrate riser so I could place it within the sump. 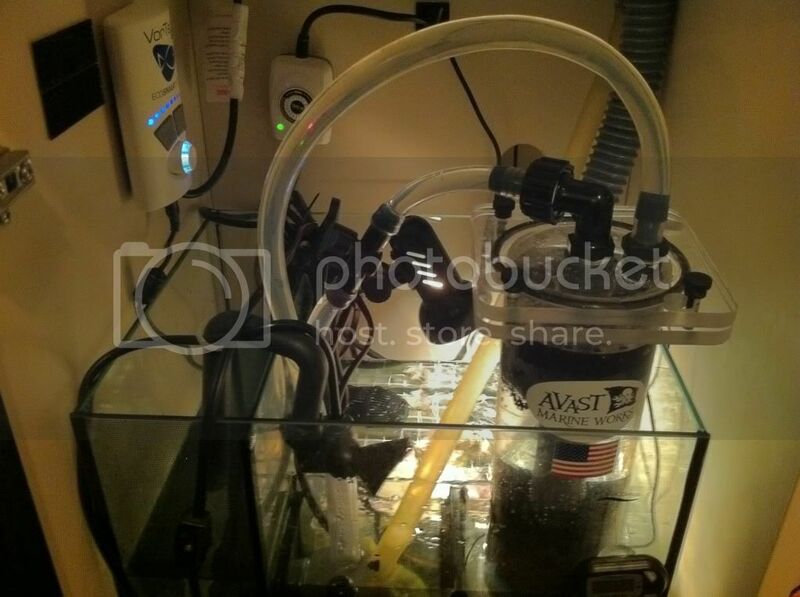 The sump also has a full refugium and frag rack built in the main chamber, measuring 6.5 wide, 10 deep and 3.5 high. The refugium portion is UNDER the frag rack. I also have a full DIY LED fixture built to be placed in this area once the driver comes in. The pictures of the TANK and LED light are within the first week of setup, and the tank has been running for 2 months now. I will get newer pictures soon. The pictures of the sump are recent. My current lighting system is a DIY LED with custom wood housing stained to match the Elos stand. 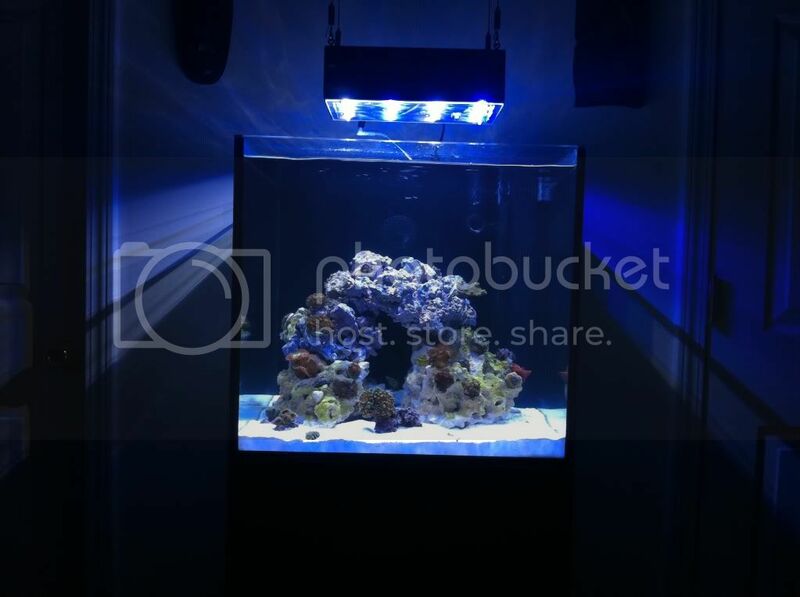 I use Cree 3W LED's (6 cool white, 6 royal blue), no optics, 6'' above the tank and using www.nano-box-reef.com drivers (microcontrollers pre-setup with dual dimming and more). Nice mod to the base. Looks like you polished it too.